The MI wire is composed of a FeCoSiB alloy with a diameter of 10 to 20 μm. It attains its amorphous state using a special manufacturing process. In this state, the wire shows ideal soft magnetic characteristics, making it optimal for high sensitivity magnetic sensors. Amorphous wires used for MI sensors are manufactured by Aichi Steel Corporation from the raw material stage using our proprietary material technology. 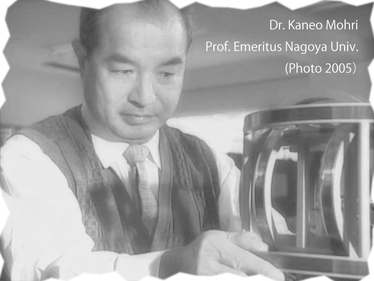 In 1993, at Nagoya University in Japan, it was discovered that when a magnetic field was applied to an amorphous wire, the impedance significantly changed and a highly sensitive magnetic sensor utilizing this effect was invented. This is the MI Sensor. Amorphous wires are highly sensitive due to their unique magnetic structure. The MI Effect (Magnetic Impedance Effect) is an electromagnetic phenomenon where the impedance of a magnetic material changes relative to the strength of the external magnetic field when a high frequency current or pulse current which causes a skin effect on the magnetic material is applied. When amorphous wire is used as the magnetic material, the effect is particularly marked. 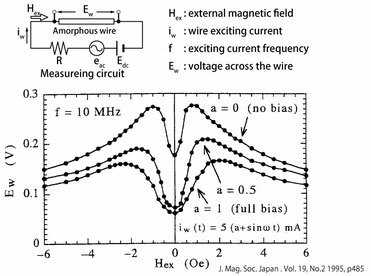 When the frequency of the pulse current applied to the amorphous wire is increased to around 10MHz the domain wall movement is suppressed, and the magnetization mainly occurs by the rotation of the magnetization vector. Unlike other types of magnetic sensors with domain wall movement, MI Sensors can attain ultra-high sensitivity with extremely low noise. 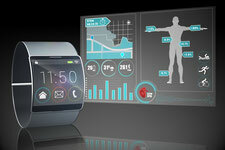 The latest MI sensor achieves very high sensitivity by applying a pulsed magnetic field equivalent to .5 to 1GHz. "Recent Advances of Amorphous Wire CMOS IC Magneto-Impedance Sensors: Innovative High-Performance Micromagnetic Sensor Chip"
A pulse current is passed through the amorphous wire and the reaction relative to the external magnetic field is detected by the pickup coil wrapped around the wire. MI elements are being developed utilizing our proprietary magnetic MEMS (Micro-Electro-Mechanical-System) technology for microfabrication of magnetic materials.